On a mission against the mega-mobsters of Intergang, the Justice League makes a stunning discovery revealing the truth behind the death of Vixen’s mother. Long ago, poachers were fingered in her murder, but stunning proof arrives exposing the identity of her real killer! And the man responsible is still alive, making a vicious play for power in the homeland Vixen left years ago. Vixen along with batman, superman and black canary are taking down an inter-gang warehouse. Once done they check the weapons and munitions only to realize that inter-gang was planning a small revolution. What’s worse they find documents linking the killer of Vixen‘s mother, Superman decides he should be the one to tell her. After she trains he comes in and lets her know that despite their original findings her mother’s real killer is still on the loose. He shows her the files and she decides it’s time to return home to Zambesi. Superman warns her to just let it go but goes anyway. Back in Africa she meets up with a childhood friend and they talk briefly before men working for Aku Kwesi, the man she’s looking for. Using her powers she dispatches the men. Much to their shock and her friend’s. She demands to know where there boss is but they don’t know they say he will now find her. 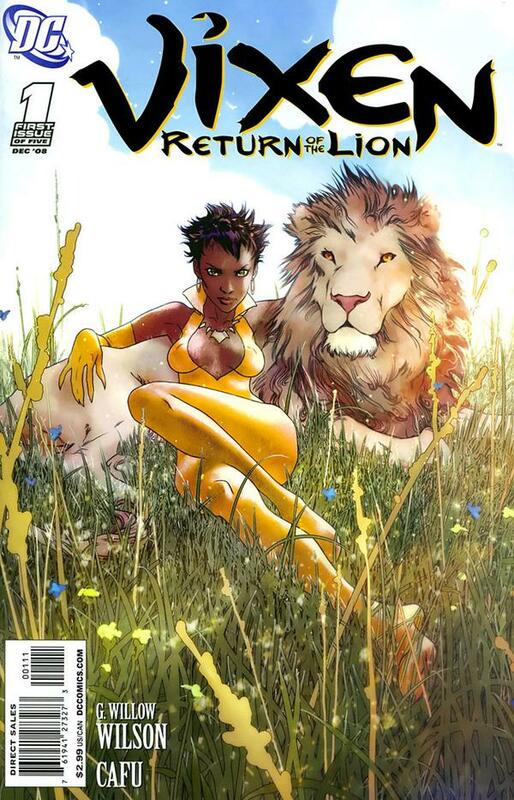 Returning to her friend she explains her powers and reveals to her that the man she’s looking for also has special powers. 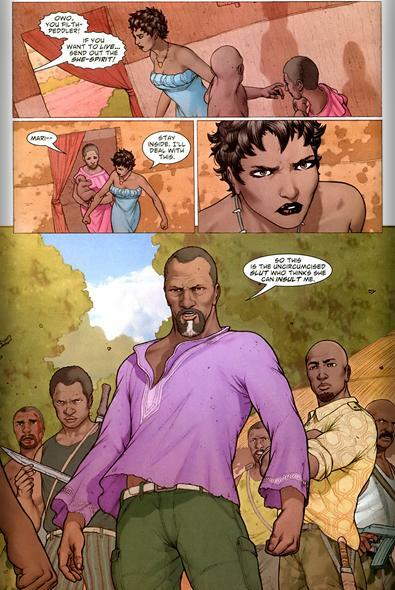 Kwesi then makes his appearance and she faces him despite her powers he defeats her with ease. Shocked and immobilized by a stomach wound. 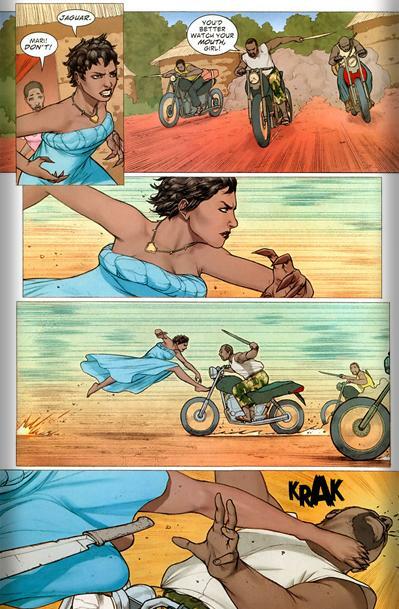 One of the men tries to save her life but Kwesi turns on gun on her saying this will be the last day of her life. Gorgeous Cover art! Just look at it! Beautiful! The art by Cafu suited the story well. Vixen had all the beauty and softness of a woman without sacrificing any of her fierceness. The art also shined in highlighting the different powers she used. The men on the other hand especially the African men all had differing dimensions which made everyone unique., which is always a plus in a comic book. Also note worthy was the story. The script by G.Willow Wilson was well very written. She managed to give readers just enough about the protagonist in one issue than most mange in three issues. She highlights her powers as well as their origin…..the totem around her neck allowing her to assume the powers of any animal of her choosing, Her place in the larger D.C universe…as a member of the Justice league and also the essence of life in Zambesi. African life is also highlighted with the huts in the rural areas and the mobs that often rule over them. The culture of female circumcision and how the lack there of is treated by men. She even manged to squeeze in the importance of an arranged marriage and having a husband. 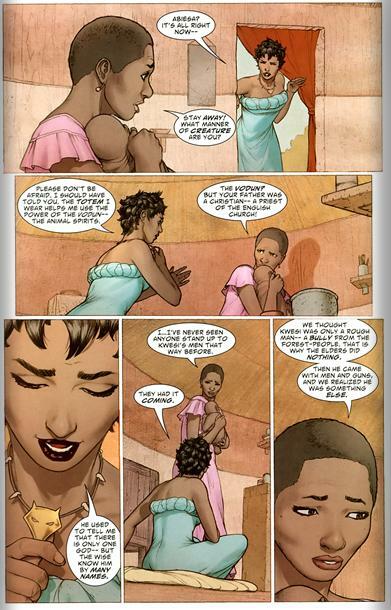 Equally worthy of praise was giving us a very brief synopsis of Vixen‘s past and establishing why this series is important in her life. We know who the villain is right off the bat we know her motivations to go after him and we know how this plays into her past and potentially affecting her future. Hate to be Nitpicky but superman looked like hell 🙂 although it’s not his book so who really cares?